When it came to the news Americans said they followed most closely in 2012, there were sizable age differences in interest over nearly all the year’s top stories. The gaps are particularly stark in attentiveness to news about national policies and politics. In October, just 9% of those younger than 30 paid very close attention to news about investigation into the attacks on the U.S. consulate in Libya; 52% of those 65 and older tracked news of the investigation very closely. The differences were nearly as large in interest to the Supreme Court’s ruling on the health care law and the fiscal cliff debate. There were substantial differences over other stories as well, including Hurricane Sandy and the negotiations between the president and congressional Republicans over the fiscal cliff. 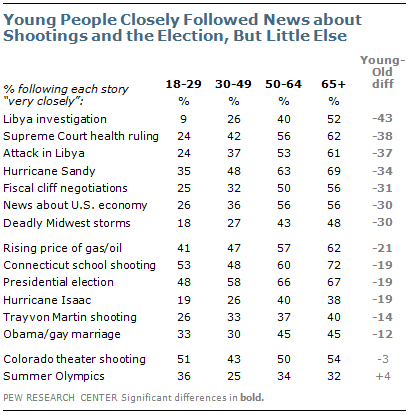 Of the 15 top stories this year, there were significant differences between young adults and older Americans over 13. The only exceptions were the shootings in the Colorado movie theater and the Summer Olympics.